The Barbie clothes and accessories in their original packaging have never been opened, and are in mint condition. Just gorgeous - what every Barbie requires. Original boxes - never opened. The Barbie clothes have never been opened and are mint in their original box packaging. Original box - never opened. This lovely Barbie doll is still her her original collectors box, and she is still attached to the cardboard in the box. She does not look as though she has ever been removed MIB. The previous owner also kept the original shipping box from Mattel. 14056 - 9993. We have a wonderful lot of items from different playsets for the Barbie fans. Barbie is not wearing her original Doctors outfit but is wearing an original Barbie 1997 Dentist white coat. It looks the part along with her stethoscope which makes the sound of a heartbeat when it is pressed. We also have another Barbie who is dressed in Doctors outfit. Barbies veterinary clinic comes with her original table which has batteries and makes a sound of another heart beat when pink button is pressed. The basket on top also makes a mewing cat sound when it is tipped up. The silver lever on the side makes a magic disappear and appearing act for the mother cat to give birth to a kitten which miraculously appears from below the mother cat (who is hollow underneath). You will also receive a blue basket for mother cat and kitten to sit in, Barbie handbag, small food bowl, another larger food bowl from Fur Real Friends, Hasbro dog house, with dogs, basket and other animals. 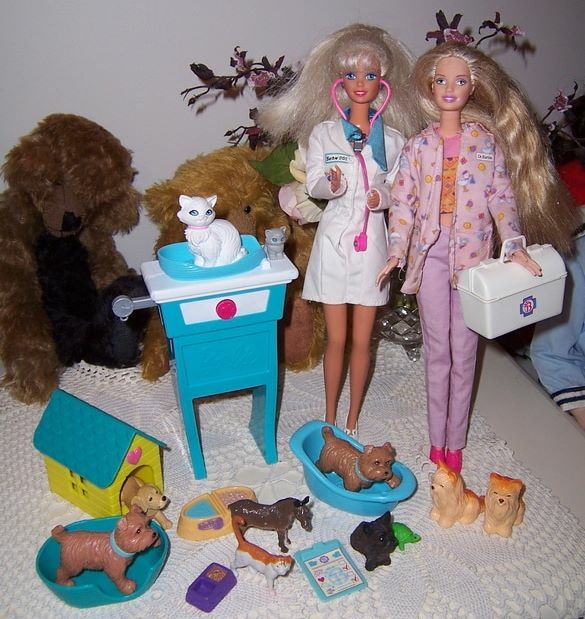 A wonderful lot of rare Barbie items to make up a Veterinary Clinic for animals. It is Mint on its card and never used. 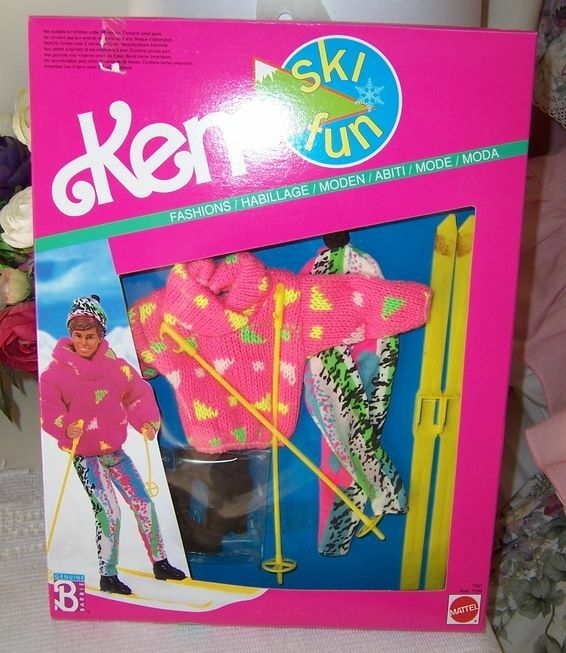 It is a vintage boxed fashion outfit called ''Ski Fun''. It was made in 1990, and the colours of fashion were indeed bright and colourful in that period. It consits of a bright pink ski jumper, colourful nylon pants, black boots, ski poles, and ski's which the boots slide into. Ken doll is not for sale, and the outfit has never been removed from the box. The box does show some slight shelf wear as you would expect from an item which is over 20 years old. It is quite rare to find this outfit in its original box and unopened. A great outfit for your Ken doll or similar type of fashion doll. The Barbie ceramic mug/cup has never been removed from its box. It has pictures of Barbie on it from over the years - very pretty. It also comes with chocolate Italian pralines but their use by date may have expired due to being over 6 years old. It would be a lovely present for the Barbie doll lover. Barbie Bathing Suit Doll is in her original box and has never been opened and is in mint condition. The box does show some light shelf wear. The popular bathing suit Barbie doll of 1959 is recreated for 2009. Barbie has her classic ponytail and striped swimsuit in a modern two-piece style, and includes a cell phone and pink sunglasses, and a pink hairbrush. She has a Barbie 50th tag around her ankle. It is Mint in its Box and never used. 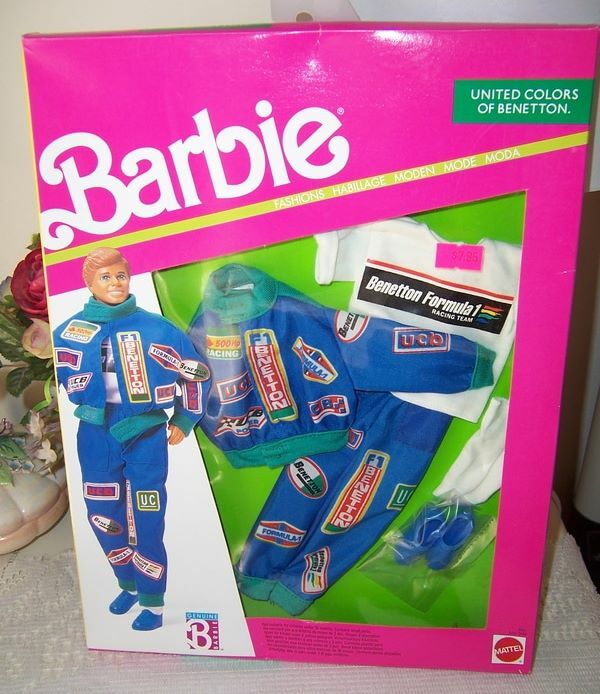 It is a track suit set with Benetton Fromula 1 racing team logos all over it. ''I can be.................'' dolls and accessories allow the young child to pretend play different roles such as a babysitter looking after a younger child. 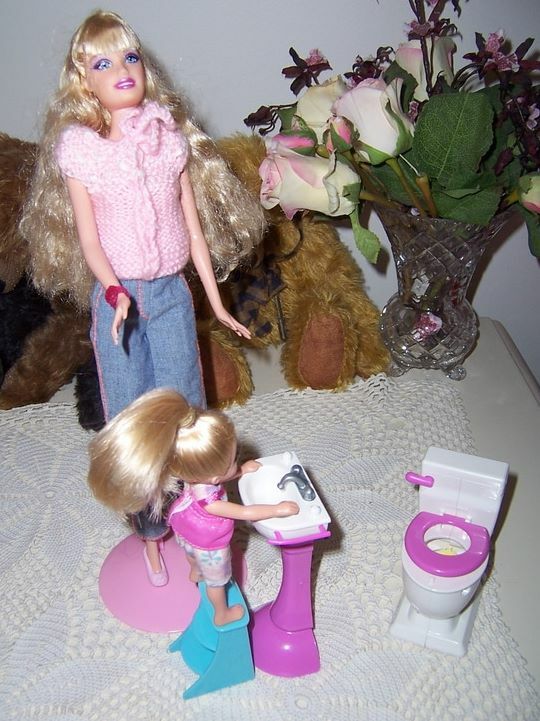 Barbie is looking after Kelly, and she is helping Kelly to toilet train, and to show her how important it is to wash your hands. The toilet's pink handle moves and makes a flushing sound, and the inside of the toilet bowl flips over to blue colour which represent clean water. When Kelly or Barbie sits onto the toilet seat it makes a humming sing song sound, and the inside of the toilet bowl flips over to being dirty. You flush the toilet again, and it flips over to clean water. There is a pedestal pink and white hand basin, with a blue stool with steps which allows Kelly to climb up and wash her hands. This play set does not come with its original box, and some items may be missing. Barbie doll is not original to the set but is a lovely doll in casual clothing. Kelly is dressed in an overall and a top. There is also a pink doll stand to help Barbie stand up. This is a great little pretend play toilet training tool. We do combine postage and also welcome pick up.